The online change-of-schedule process replaces the paper Change-of-Schedule Form otherwise known as the “Blue Form”. The online form, when submitted, notifies the student’s advisor and others involved in the process. To request a schedule change or add a writing option after the registration portal closes, simply follow the instructions below. Please note this is a request for a change and approval is not guaranteed. The deadline to add or drop full semester courses and first module courses is Thursday, January 26. The Add/Drop option in the system will not be available after the deadline and students will be required to petition if a change is needed. 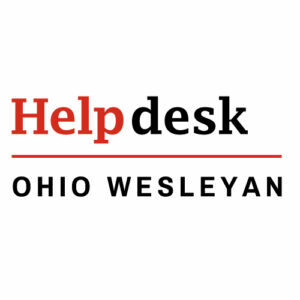 To start the process, click here or enter the following web address https://admin.owu.edu/cgi-bin/student/OWerpChgSchedStu.cgi. 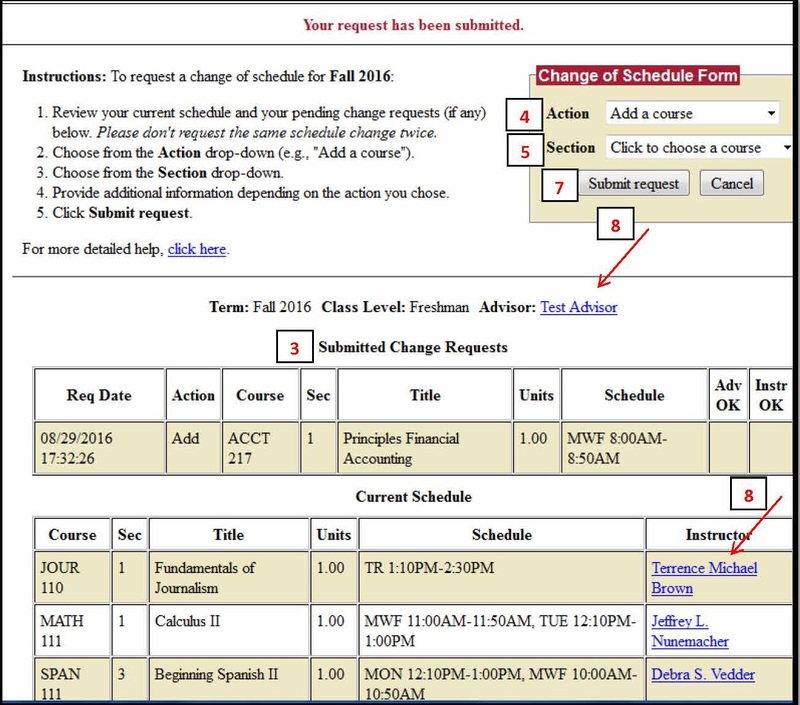 Students may also access the system by selecting the Schedule Change Request option located under Resources on the Registrar’s Office website. Log in using your username and password. The username is your student email address minus the @owu.edu. Review your current schedule and your pending change requests (if any). Please do not request the same schedule change twice. Choose from the Action drop-down (e.g., “Add a course”). Choose from the Section drop-down. Provide additional information depending on the action you chose. To email your professor or advisor, click his or her name on the screen. See the screenshot below for visual aid. 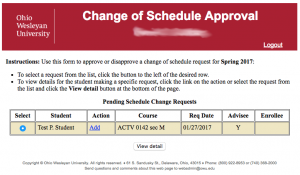 After you submit your schedule change request, you will receive an email confirmation, which will also be copied to your advisor and the course instructor. When your advisor and the course instructor submit their decisions, you will get additional email messages saying whether the request was approved or disapproved. In addition, the Adv OK and Instr OK columns in the list of your submitted change requests on this page will show whether a request has been approved (Y), disapproved (N), or is still undecided (blank) by your advisor and/or the course instructor. After both your advisor and the course instructor approve your request, the Registrar’s office will still need to make the appropriate change to your academic records, so allow for at least 1 full business day after receiving final approval before the change appears in your official schedule. Changes are made in the order received. Please contact the Registrar’s Office at registrar@owu.edu or 740-368-3200 if you need assistance. Once a student requests a change of schedule or addition of a writing option, the system sends an email to the student, the advisor, and the instructor. To process the request, please follow the steps below. All pending schedule change requests will appear on the screen. If the student is your advisee, then a Y will appear in the Advisee column. If the student wants to add the class, a Y appears under Enrollee. Click the button next to the student’s name to select and then click the View detail button. 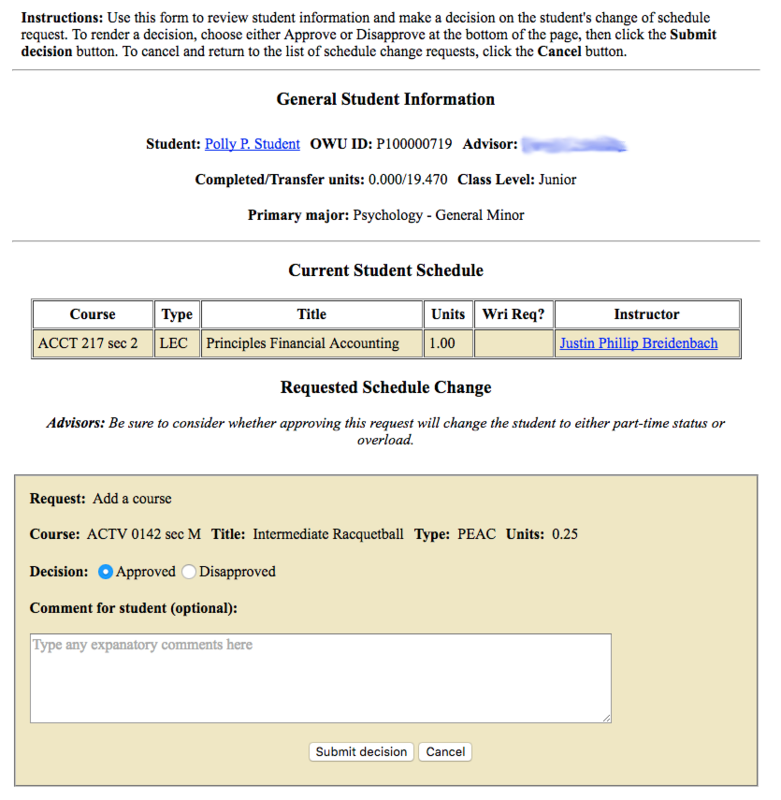 The student’s current schedule will appear with the decision box below it. Select Approved or Disapproved and click the Submit decision button. 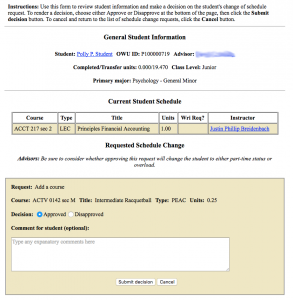 The system notifies the student, advisor, and instructor of the decision via email. Once the student receives approval from the professor and advisor, the registrar’s office processes the request in the order received. NOTE: The registrar’s office considers any Change-of-Schedule Form submitted prior to the deadline to be on time regardless of the approval status. Students may email the advisor or Instructor with more information by clicking on the person’s name in the system.